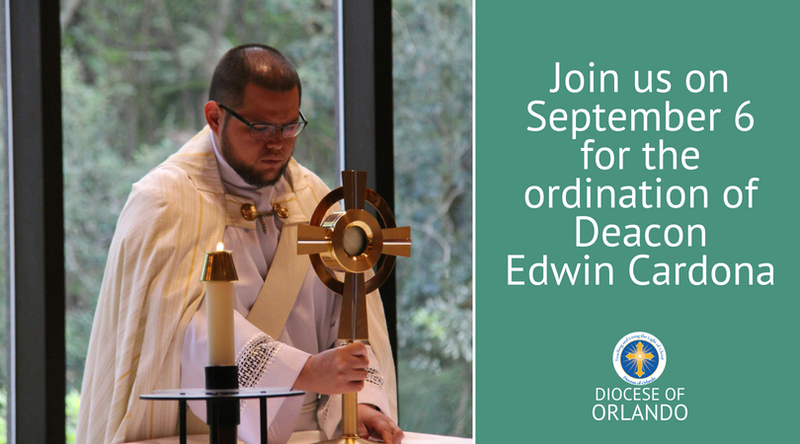 Transitional Deacon Edwin Cardona has been discerning priesthood since his senior year in high school. That dream will finally become reality on Sept. 6. He recalled the year he felt God knocking on his door as a particularly formative time in his formation. “I started learning a lot about my faith,” he said. “St. Catherine of Siena (Parish) in Kissimmee really started becoming my family, my extended family. And the more I got to know them, the more they started to notice some gifts in me, some things that would make me a good priest.” He admits, at first, he was not convinced. Then Father Joseph Bellerive invited Cardona to visit St. John Vianney College Seminary in Miami. The faith of the seminarians and their warm hospitality convinced him to answer God’s call, but family weighed heavily on Cardona’s mind. His brother, Ronal, died that same year. The loss unified his family in a powerful way and made leaving for the seminary very emotional. However, Cardona found solace with his fellow classmates and spiritual direction that helped him grieve. He even shared what he learned with others in bereavement ministry. It was not just immediate family Cardona had to part with, he also had to learn to say goodbye to the family he dreamed he would have one day – the children he always wanted. “In hind sight, I can see how that challenge was calling me to have a deeper appreciation for the vocation of marriage,” he explained. Upon deeper reflection and prayer, he said, “I came to see it as something beautiful, as God’s gift for me to serve families.” He also shared he has always idolized hard-working, dedicated, and self-sacrificing people. “The Lord has always helped me be someone who is loyal, be someone that people can count on,” he acknowledged. He plans to use those strengths when he becomes a priest. Deacon Cardona will be ordained to the priesthood at Corpus Christi Parish in Celebration on Sept. 6 at 10:30 a.m.